Hardcover, 7.75 x 10.5 in. / 276 pgs / illustrated throughout. Edited by John G. Hanhardt. New Lower Price! No artist has had a greater influence in imagining and realizing the artistic potential of video and television than Nam June Paik. Through a vast array of installations, videotapes, global television productions, films and performances, Paik has reshaped our perceptions of the temporal image in contemporary art. 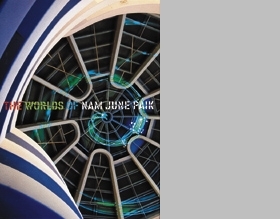 The Worlds of Nam June Paik is a celebration of the moving image and an appreciation of Paik's impact on the art of the late twentieth century. The full range of Paik's singular achievement is represented--from his early 1960s performance pieces through his videotapes, installations, megatrons and celebrated robot portraits--including his recent, spectacular laser-projection installations in the rotunda of Frank Lloyd Wright's Solomon R. Guggenheim Museum. In an informative and personal essay, John G. Hanhardt, a longtime supporter of Paik's work, provides an overview of the artist's career while focusing on his important place in the history of the moving image. Also included are a selected exhibition and performance history as well as a selected bibliography. FORMAT: Hardcover, 7.75 x 10.5 in. / 276 pgs / illustrated throughout.